This a piece that I wrote for Grazia last week, and I thought it would be a waste to not have it displayed on my page too. A really simple piece simply about my favourite corner of my home. An instagram go to corner. I kept the walls white in the living room as it’s then easier for me to change the vibe quickly with different furniture, vases and flowers. Some prints are leaning against the wall, some are actually up. My favourite is this piece by Thierry Porter; I just love the colour! People normally say how chic this space is; it’s a corner that reflects the current style of my wardrobe at the moment, in a way. I’m leaning towards a more warm and neutral palette at the moment, collecting pieces for my future (bigger) home. 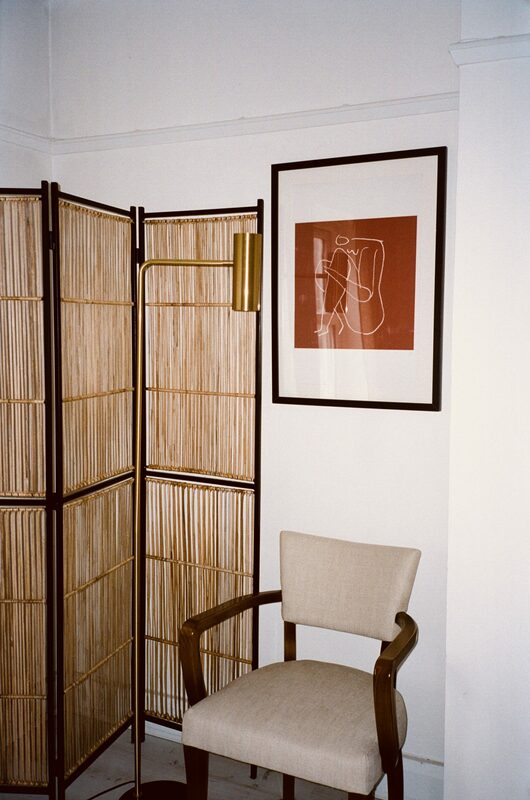 I really love the rattan room divider from French Connection and the linen chairs from Soho Home. The mirror coffee table is years old from Next – but it’s something people comment on the most. Flowers and magazines, I think, are actually key to giving your place personality. A minimal home is the dream, but it still needs to have accents of you to make it homely. Also I think my niche is making small space and corners busy – I love the intimate feeling it gives you.